I feel all of you with what you’re going through on these early days of the Whole30. I’m on day 11 and it is much better. So hang in there you guys can do it. Treat yourself kindly, take a nice warm Epson salt bath and have a nice soothing cup of tea. You all have got this and you’re doing awesome. On a funny note I just brewed a pot of water. Was thinking I was making coffee but forgot to put the grinds in. Anyway got my coffee brewing now. I got my food planned today thanks to @LadyLisbette giving me a helpful nudge on my 4/1 thred. Not too many people posting there now. So I may be coming over here from time to time for support I hope that’s OK.
@Elizabeth33 Thank you for the recipe! I want to try it this weekend. Tomorrow I'm going to the farmer's market for some fresh local foods! I'll definitely be getting eggs and chicken, but I'm not sure how much else there will be this early in the year. Maybe some root veggies, salad greens, and strawberries? I hope so! @Elizabeth33 yes, of course, make yourself at home here! So glad you're doing well - that's funny about the coffee. I'm planning to take your advice and enjoy luxurious baths on this round - since we moved into the new place, I've been waiting on a repair that needs to be made to our tub, and that is happening today - yay! A hot bath tonight. Congrats, @HopingtoHeal on your husband's new job, and on NOT having any regrets for celebrating. That's the way to do it, making a decision you can live with, and loving yourself as you would your dearest friend. Will you start again soon, or take your time? I've been sleeping well, and the energy level is good. I did snack yesterday on an Rx bar, which had become an almost daily habit, so I'm watching out for that. Another habit I acquired along the way, even during my last W30 in December, was eating only two meals. I've been eating three meals a day, and waking up feeling hungry, but not as hungry, which feels better. One of my goals this round is to do anything and everything that supports good sleep. No kombucha after 11 am (I can't tolerate coffee or black tea), tapering down the water intake after 5 pm and drinking a small amount of water at dinner or herbal tea, and plenty of movement. In previous rounds I experienced Tiger Blood, but often the famous deep sleep eluded me. So I'm taking this good sleep in the early days of this round as an early NSV. Yay! Later on I'll cook up a giant batch of hash: 3 lbs. ground turkey seasoned with Lebanese 7-spice blend from Well Fed (Mel Joulwan is my fairy godmother) and a sautee of onion, mushroom, parnsip, and maybe stir in some coconut milk. I also have a Thai carrot soup on the agenda one day soon. its Saturday in my part of the world and I couldn't be more grateful for the weekend. Really looking forward to the space and time to do a bit more reflecting and planning. yesterday was a bit of a fail for me. I had grandkids in the early morning (my daughter is a nurse) and then took the day off to care for a friend in final stages of cancer. I was vaguely organised foodwise but in the hurleyburley of it all I lost my appetite and motivation. Ended the day on couch with project runway and leftovers- not such a bad Friday night! @LadyLisbette your comment made me laugh! I'm a psychologist but can never get hypo and hyper right in my head which has lead to some pretty confusing conversations but yes way too much cholesterol. Unfortunately it's a genetic problem in processing fats. 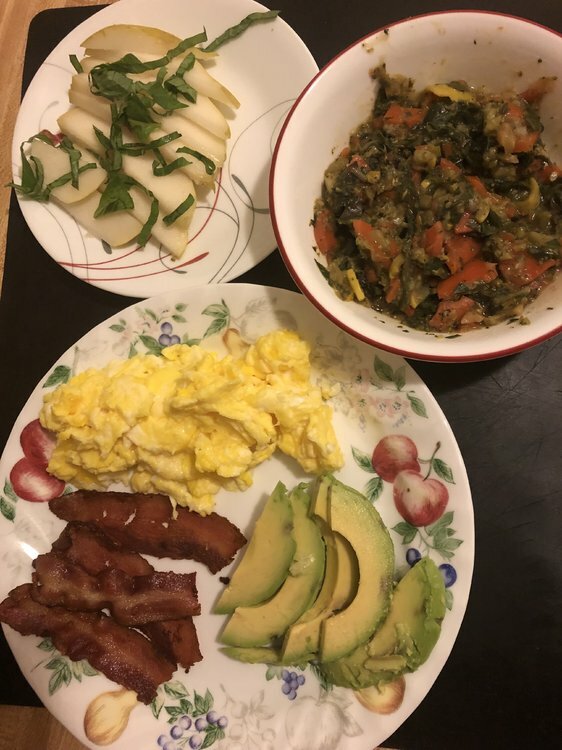 A few years back I did try 6months of a paleo diet with the support of a nutritional medicine doctor but my cholesterol results just kept climbing and eventually I had to accept that for me paleo/AIP/whole30 etc sill needs to be low fat and more from avocado and olive than meat. The rest of my family are on medications so staying under clinical threshold is my goal. all the best to everyone on this journey! I hope all are doing well. I have made a big decision and taken a lot of thought on this. I have decided to restart and today is my day 0. I have been eating things that are “compliant “ but are known to cause digestive issues for me. My excuse was just get through a “compliant” one and continue the next one taking out the other things you need. Just get through 1 successfully and continue as a gradient to get rid of things until I am completely leaky gut/aip with out the high lectins foods. But I should not be doing things that I know cause my stomach to possibly get upset like store bought sausages with garlic and onions or the teriyaki coconut aminos even though I seem to do ok. And the big one if coffee which always upsets my stomach. I am sensitive to garlic, onions, most peppers, tomatoes and citrus. So this is what I am doing this round: I am excluding garlic, onions, peppers, tomatoes, citrus and coffee in addition to the regular excluded items outlined in the Whole30. I have removed some of the supplements that I’ve chosen to use that I have discovered have items that are not compliant. I am going to continue to take the ones that are prescribed by my chiropractor and MD. When it is time to continue into round 2 I will continue to eliminate things and will deal with that choice list at that time. Everyday I will go through Day by Day book and post what I eat. My goal is to get down to 3 meals a day and only snack when it is absolutely necessary. No more munchies compliant items especially nuts after dinner. Focus on not feeding the sugar dragon with compliant foods but using protein and fat if needed without high carb foods but not with nuts. Only 1 serving of nuts per day and I must use other sources for fat. @Elizabeth33 This sounds really smart, and well considered. Congrats on your decision. I sympathize with you, having the hard-to-avoid extra things that aggravate your gut. We have in common a sensitivity to coffee - I have finally let it go completely for the last few months, after years of being on again-off again. I cannot tolerate even decaf. I don't know why, I just know that my stomach will not tolerate. Gut health is everything, so I admire the way you are organizing your thoughts around it. You sound like a woman with a plan....You can do this! @Pipi Can you eat/do you like fatty fish like salmon? I noticed that wasn't part of your discussion in the last post. Where I live wild salmon is a tad pricey but I can make a fillet last for several meals - hot out of the oven, then leftover. The canned salmon and also canned mackerel, yum, are undetermined re wild or farmed, but they are affordable, and they both make delicious fish cakes, which I enjoy hot or cold in salads, and they freeze well. Also, yay for flower seedlings! I've had several very active days- lots of deep cleaning at home and work. My back felt drained when I went to bed last night, so I am being careful to get lots of stretching, which is my favorite, anyway, when I make time. So I'm making time! im feeling very positive but totally knackered. I was reading about day 10 being a roadblock for many people- and I get that the novelty of endless shopping, prepping, cooking, cleaning up and eating is wearing pretty thin but having said all that I feel determined. i spent an hour or so plotting out my reintroductions which take me all the way through to October. Its a long haul but it does mean many weeks I get back a food. Right now I'm hanging out for May when fingers crossed I get back eggs, butter and cheese- omelette time! So I got some veggie prep done today. I made steamed asparagus, baked sliced mushrooms, delicata squash, coconut aminos baked bak choy, and a veggie casserole. The casserole was a risk because when I planned it I was going to use this tomato substitute which I found out I can not do. So I made it with chicken stock. I am hoping it is good. I will let you know. I have done my day 0 on the Day by Day and redid my if/thens and updated my goals which are pretty much the same as day 1 on April 1st. I am excited that I am restarting and not waiting a month or 2 before getting back on it. I hope everyones day went great. One day at a time @Elizabeth33, that's the way to do it. How was your casserole? Today was good....I am enjoying leftover hash made with ground turkey, Lebanese 7-spice blend, with parsnips, onion, mushroom and kale, and I love to eat it with steamed baby green beans, a little yams, and a dollop of homemade mayo. Heaven. I'm going to try to remember to make it without onion next time, @Elizabeth33 and if it is still tasty I'll let you know. Your presence here makes me realize that I take for granged how much garlic and onion I rely on, and makes me wonder what it would taste like without. Tonight we ate out, and my safe meal at this place is grilled chicken over green salad with avocados and olives, and oil and vinegar for dressing. At home I love to use walnut oil for dressing - it's a tad pricey, but I find it worth it in spades - so yummy, and if I haven't had enough fat on my plate, I eat a spoonful of it, and it's pure manna. I've been doing 20 minutes or so of yoga every day, and often a quick walk. My self respect has a boost and my energy is good. Most nights I'm sleeping well. Onward! Hope everyone is doing great! Yay I started today. The veggie casserole was ok. Not as good as it would have been with tomato sauce. That really makes it. I made a lot so I am freezing the rest. I think it should be fine since it has enough liquid in it and the vegetables are mushy anyway so I think the texture will be fine once I defrost. Looks yummy! Is that a plate of sliced pears with mint? Very nice. Your dishes are very pretty, too. Mix thoroughly, and shape into sliders, and bake in a 350-375 degree oven for about 20 minutes or until it reaches 165 degrees with an insta-read thermometer. Today I used 3 lbs of ground chicken thighs (I special order this from the good meat market in town) and two apples. I now have lots of food on hand! I also went food shopping so I have plenty of greens, French green beans and broccoli, as well as a fresh batch of mayo. I'm in good shape!